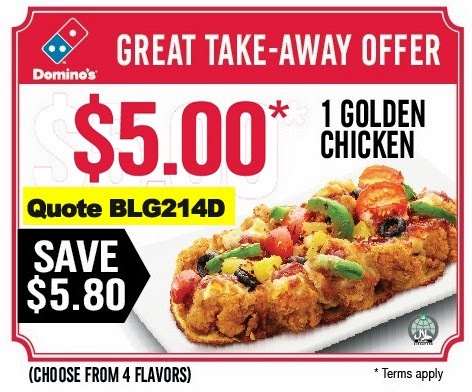 Home / 2015 singapore coupon / birthday coupon / dominos promo code / free dominos chicken / singapore birthday treat / singapore discount / singapore discount codes / singapore free treat / singapore promo code / Join the Domino's GOLD RUSH with Domino's Golden Chicken! 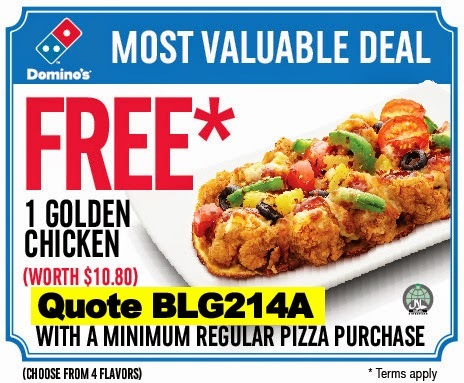 Join the Domino's GOLD RUSH with Domino's Golden Chicken! One of the most auspicious ways to spend Chinese New Year is wolfing down something prosperous in name — Domino's newly launched Golden Chicken series! Are you feeling really lucky and blessed this year? Well, find out how to win $2,000 worth of shopping money, sessions with a personal shopper and a plush limousine ride. If these don't entice you, there's the iPhone 6 GOLD (64GB) and a genuine gold bar up for grabs! Isn't it WONDERFUL that all these newly-launched chicken items are oven-baked? Baked chicken is embraced by Koreans — and it makes for crispy yet healthy chicken with maximum roast fragrance. With this Golden Mediterranean Chicken, I wish for you to find a 'cherry' love with your special someone. Oven-baked chicken tenders covered in Neapolitan sauce, cherry tomatoes, olives and feta cheese. Golden Outback Chicken is my personal favourite — chicken with BBQ sauce and finely-balanced seasoning. It was awesome. This is topped with green capsicums, red capsicums and olives. This demonstrates my fiery burning love for my readers. Enjoy these oven-baked spicy chicken tenders covered with pesto sauce, pineapples, juicy tomatoes and mozzarella. This strongly challenges the Golden Outback Chicken for top spot! Spicy chicken tenders drenched in salsa, pineapples, green capsicums, olives and cherry tomatoes. For the health-conscious who decide to compromise a little for the festive season. 2. Download the contest form here — you may also obtain the form from Domino's. 3. Peel the golden sticker from your Golden Chicken box. 4. Collect 3 stickers and attach them to your contest form. 5. Write the words "Golden Chicken" in your MOST creative fashion. 6. 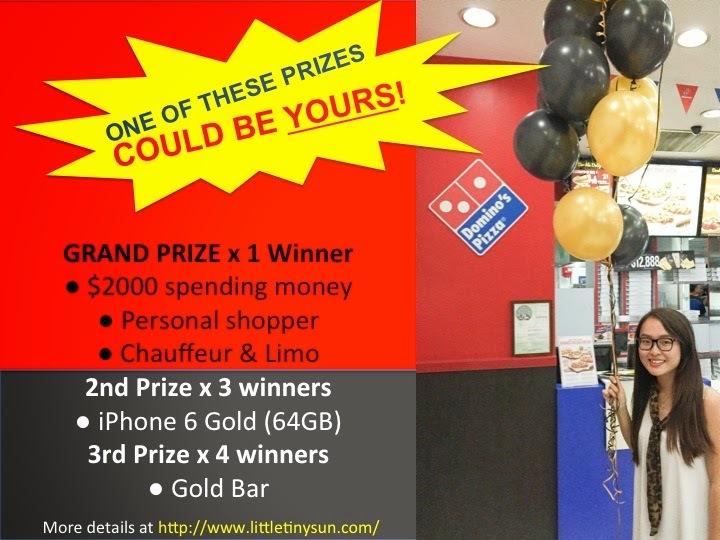 Submit your entry at any Domino's store or mail it to 81 Ubi Avenue 4, #10-16 Singapore 408830 by 8 March 2015! 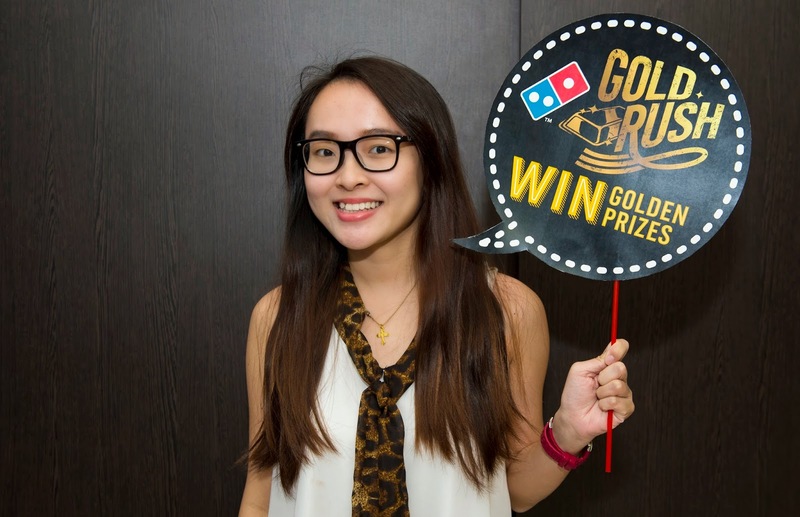 Don't miss your chance —be part of Domino's Gold Rush now! 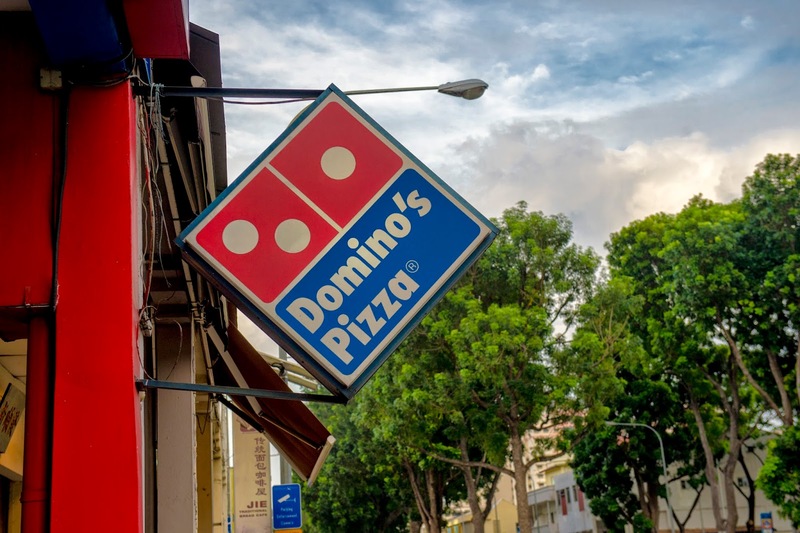 Don't forget to like Domino's Facebook page too! 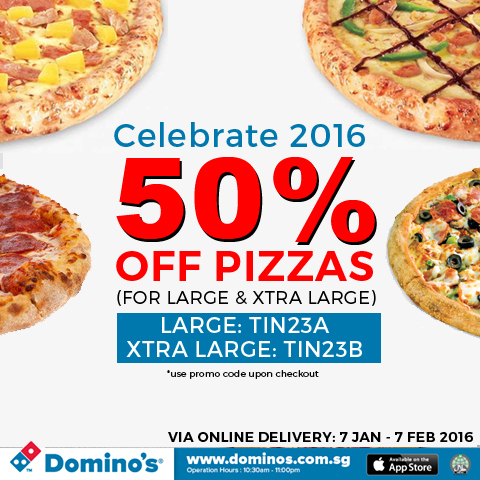 Enjoy 50% off any Large or Extra Large pizza (No Minimum order required)! Promo code is valid from now till 7 February 2016.